With a sixteen-year-old in the house, a lot of thought has gone into this decision. My number one pick for the best cars for teens is by far the 2018 Kia Rio. Between the safety features, size, cost, and style, the only surprise is that my teenager and I finally agree on something. A first car is a huge deal, and we’re usually bickering about, well, all the things. I was able to experience the brand new Kia Rio during the National Press Introduction in Baltimore. All thoughts and opinions shared here are my own. Curfew alert – Via an app on my phone, I can set time and distance parameters for my teen driver. If he breaches either, I get an alert. I’m already a total SnapMap stalker, so this is a fantastic time-saver! Parking minder – New drivers especially need all the help they can get when maneuvering tight parking spots. AND, I just realized when you put the car in reverse, the volume of the music dramatically lowers, forcing you to be totally in tune with your surroundings. As soon as you put the vehicle back in drive, the volume reverts to where you had it. Android Auto/Apple CarPlay – Once synced via your phone, your Rio is a hands-free fun zone. You can verbally command Google to play your favorite songs, guide you to your destination, and make your phone calls. When linked, your phone is locked, so there is no temptation to text and drive. The Kia Rio is also super budget friendly. With a starting price of just $13,900, this is the perfect first car. Plus, it’s wicked efficient. In the presentation at the press event, they said the Rio would get around 27 city and 37 highway miles per gallon. However, when Natasha and I road tripped home through the mountains in SPORT mode, (post coming soon,) we were averaging 39.5 MPG! His first impression: “Woah, it looks cool! Especially on the inside!” That sharp, two tone, red and black interior is definitely impressive. The 5-door hatchback is also preferred amongst his age group. It’s the perfect size. After I made him learn how to drive in my massive F-150, he can now drive almost anything. But he loves that this is big enough for his friends and all their athletic gear, but small enough to be “so easy” to drive. The Rio’s turn radius is crazy comparatively speaking. But, they also doubled the number of teeth in the steering column, so it’s much more responsive. Adam is also thrilled to hear about the affordability and fuel efficiency. Twenty bucks to practically fill the tank once a month? That’s a teenage budget dream. 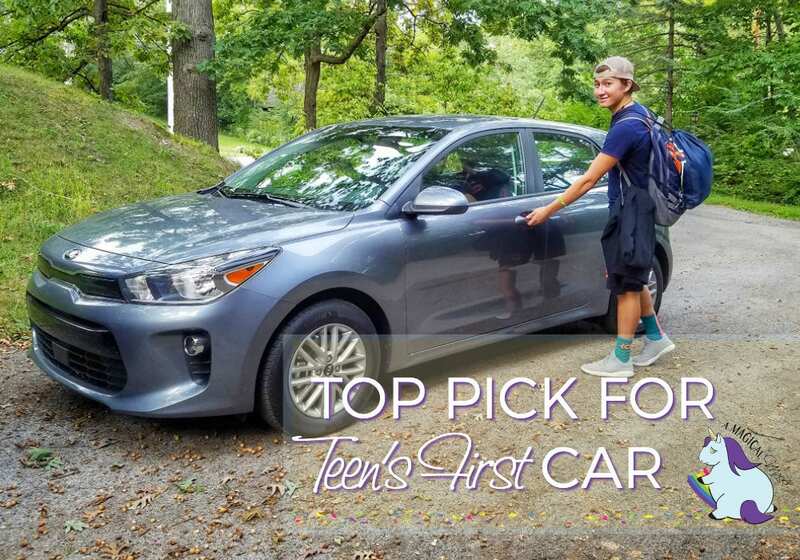 Best car for teens–yes–but also Grandparents and anyone on a budget. Who do you know that would love the 2018 Kia Rio? 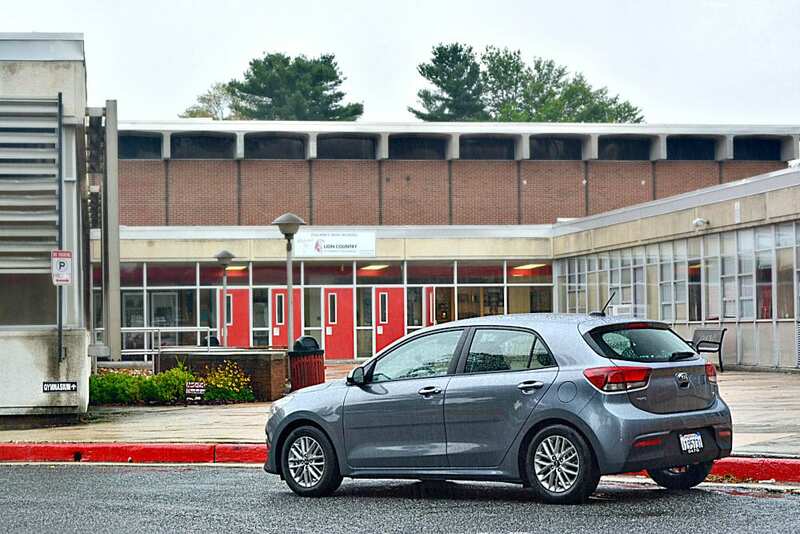 Find out more about the Kia Rio and follow Kia on Facebook, Twitter, and Instagram for all the latest updates! Bookmark this page for all my personal Kia adventures too! Thanks for the great suggestion. We have just a couple short years to figure out what our kids will drive. I always joke they will have a rusty old pickup. Wow. Those things are pretty. I don’t know if I’d let my teen drive something like that. It’s like letting the toddler around the 500 piece Lego Melenium Falcon I just put together… Some things are too pretty to risk! Since my three kids are close in age, I would be open to purchasing a Kia Rio for them to share. We have owned our Kia (Sorento) for five years now and totally love it! This brand truly makes exceptional vehicles! My daughter will be getting her license in January and has been practicing in my big seqoiua. Will have to check this car out soon.